Just like we did with our non-Twisted asynchronous client. Which isn’t surprising as they are doing essentially the same thing. Let’s take a look at the source code to see how it works. Open up the client in your editor so you can examine the code we are discussing. Note: As I mentioned in Part 1, we will begin our use of Twisted by using some very low-level APIs. By doing this we bypass some of the layers of Twisted’s abstractions so we can learn Twisted from the “inside out”. But this means a lot of the APIs we will learn in the beginning are not often used when writing real code. Just keep in mind that these early programs are learning exercises, not examples of how to write production software. This method gives Twisted a file descriptor you want to monitor for incoming data. Why are we passing Twisted an object instead of a file descriptor and a callback? And how will Twisted know what to do with our object since Twisted certainly doesn’t contain any poetry-specific code? Trust me, I’ve looked. Open up the twisted.internet.interfaces module and follow along with me. There are a number of sub-modules in Twisted called interfaces. Each one defines a set of Interface classes. As of version 8.0, Twisted uses zope.interface as the basis for those classes, but the details of that package aren’t so important for us. We’re just concerned with the Interface sub-classes in Twisted itself, like the ones you are looking at now. One of the principle purposes of Interfaces is documentation. As a Python programmer you are doubtless familiar with Duck Typing, the notion that the type of an object is principally defined not by its position in a class hierarchy but by the public interface it presents to the world. Thus two objects which present the same public interface (i.e., walk like a duck, quack like a …) are, as far as duck typing is concerned, the same sort of thing (a duck!). Well an Interface is a somewhat formalized way of specifying just what it means to walk like a duck. A quick note on terminology: with zope.interface we say that a class implements an interface and instances of that class provide the interface (assuming it is the instances upon which we invoke the methods defined by the interface). We will try to stick to that terminology in our discussion. IReactorFDSet is one of the Interfaces that Twisted reactors provide. Thus, any Twisted reactor has a method called addReader that works as described by the docstring above. The method declaration does not have a self argument because it is solely concerned with defining a public interface, and the self argument is part of the implementation (i.e., the caller does not have to pass self explicitly). Interface objects are never instantiated or used as base classes for real implementations. Note 1: Technically, IReactorFDSet would only be provided by reactors that support waiting on file descriptors. As far as I know, that currently includes all available reactors. Note 2: It is possible to use Interfaces for more than documentation. The zope.interface module allows you to explicitly declare that a class implements one or more interfaces, and comes with mechanisms to examine these declarations at run-time. Also supported is the concept of adaptation, the ability to dynamically provide a given interface for an object that might not support that interface directly. But we’re not going to delve into these more advanced use cases. Note 3: You might notice a similarity between Interfaces and Abstract Base Classes, a recent addition to the Python language. We will not be exploring their similarities and differences here, but you might be interested in reading an essay by Glyph, the Twisted project founder, that touches on that subject. According to the docstring above, the reader argument of addReader should implement the IReadDescriptor interface. And that means our PoetrySocket objects have to do just that. And you will find an implementation of doRead on our PoetrySocket class. It reads data from the socket asynchronously, whenever it is called by the Twisted reactor. So doRead is really a callback, but instead of passing it directly to Twisted, we pass in an object with a doRead method. This is a common idiom in the Twisted framework — instead of passing a function you pass an object that must provide a given Interface. This allows us to pass a set of related callbacks (the methods defined by the Interface) with a single argument. It also lets the callbacks communicate with each other through shared state stored on the object. I left out the docstrings above, but the purpose of these callbacks is fairly clear from the names: fileno should return the file descriptor we want to monitor, and connectionLost is called when the connection is closed. And you can see our PoetrySocket objects provide those methods as well. Finally, IFileDescriptor inherits from ILoggingContext. I won’t bother to show it here, but that’s why we need to include the logPrefix callback. You can find the details in the interfaces module. Note: You might notice that doRead is returning special values to indicate when the socket is closed. How did I know to do that? Basically, it didn’t work without it and I peeked at Twisted’s implementation of the same interface to see what to do. You may wish to sit down for this: sometimes software documentation is wrong or incomplete. Perhaps when you have recovered from the shock, I’ll have finished Part 5. Our new Twisted client is really quite similar to our original asynchronous client. Both clients connect their own sockets, and read data from those sockets (asynchronously). The main difference is the Twisted client doesn’t need its own select loop — it uses the Twisted reactor instead. The broken client doesn’t bother to make the socket non-blocking. The doRead callback just keeps reading bytes (and possibly blocking) until the socket is closed. Aside from a slightly different task order this looks like our original blocking client. But that’s because the broken client is a blocking client. By using a blocking recv call in our callback, we’ve turned our nominally asynchronous Twisted program into a synchronous one. So we’ve got the complexity of a select loop without any of the benefits of asynchronicity. The sort of multi-tasking capability that an event loop like Twisted provides is cooperative. Twisted will tell us when it’s OK to read or write to a file descriptor, but we have to play nice by only transferring as much data as we can without blocking. And we must avoid making other kinds of blocking calls, like os.system. Furthermore, if we have a long-running computational (CPU-bound) task, it’s up to us to split it up into smaller chunks so that I/O tasks can still make progress if possible. Note that there is a sense in which our broken client still works: it does manage to download all the poetry we asked it to. It’s just that it can’t take advantage of the efficiencies of asynchronous I/O. Now you might notice the broken client still runs a lot faster than the original blocking client. That’s because the broken client connects to all the servers at the start of the program. Since the servers start sending data immediately, and since the OS will buffer some of the incoming data for us even if we don’t read it (up to a limit), our blocking client is effectively receiving data from the other servers even though it is only reading from one at a time. But this “trick” only works for small amounts of data, like our short poems. If we were downloading, say, the three 20 million-word epic sagas that chronicle one hacker’s attempt to win his true love by writing the world’s greatest Lisp interpreter, the operating system buffers would quickly fill up and our broken client would be scarcely more efficient than our original blocking one. I don’t have much more to say about our first Twisted poetry client. You might note the connectionLost callback shuts down the reactor after there are no more PoetrySockets waiting for poems. That’s not such a great technique since it assumes we aren’t doing anything else in the program other than download poetry, but it does illustrate a couple more low-level reactor APIs, removeReader and getReaders. There are Writer equivalents to the Reader APIs we used in this client, and they work in analogous ways for file descriptors we want to monitor for sending data to. Consult the interfaces file for more details. The reason reading and writing have separate APIs is because the select call distinguishes between those two kinds of events (a file descriptor becoming available for reading or writing, respectively). It is, of course, possible to wait for both events on the same file descriptor. In Part 5, we will write a second version of our Twisted poetry client using some higher-level abstractions, and learn some more Twisted Interfaces and APIs along the way. Fix the client so that a failure to connect to a server does not crash the program. Use callLater to make the client timeout if a poem hasn’t finished after a given interval. Read about the return value of callLater so you can cancel the timeout if the poem finishes on time. I just don’t get how to solve your second suggested exercise. Would you please explain how to do it? Why should I call my function with callLater? I’d like to call it now and if it hasn’t finished in some period of time, then it should be canceled (like socket timeout). But callLater will call my function later and not now. 1. Invoke your operation as you normally would. In this case that means creating the PoetrySocket objects. 2. Invoke callLater on another function whose job it is to cancel the first one, if the first one hasn’t already finished. What the second function actually does is going to be context-specific. For a PoetrySocket object, that probably means unregistering itself from the reactor and closing the raw socket. Does that make sense? Dave, thanks so much for clarification. Looks like callLater with possibility of canceling is a powerful tool! Yes, canceling asynchronous operations is often convenient. With the release of version 10.1.0, Twisted added some features for doing that. I’ll be discussing them in Part 19. Thanks for another good article on Twisted. Hi Dave and thanks for the great tutorial on Twisted! at the first iteration of the while loop and bytes is not empty after that. Maybe this is better, it reads the poem with 4 iterations of the while loop. is an upper limit on the number of bytes to read, not necessarily how many you actually get. I did not post more messages after the previous one. I suspect that this problem is universal for all the code using the parse_args() function. Just been through my copy of the code with find and replace, and now have a version of all clients which should work. Would you like me to send this to you and save yourself five mins, and if how? Hi Thomas, I would appreciate that. Do you have ‘git’ installed, are you able to generate a patch? That would be best for me. But if not, you can just send me a zip file with your code. Unfortunately I don’t have git. Using windows restricts my ability to use git quite a lot. Where should I send the zip file??? I have use a ported version of diff to produce a patch file using unified diff. Thanks, I’ll apply as soon as I can. Fixed! I think either case actually works. My URL had an extra ‘http://’ prefix (it’s an artifact of the wordpress link editor UI that often gets me). The blocking client can be fixed fairly easily. The only reason it “blocked” and read in each poem in its entirety is because of the “while True:” loop in the doRead. I thought this may cause problems if the data received was larger than 1024 but I made my blocking server send the whole poem (using ecstacy) and the doRead was called until all the data was received/read in. I don’t know if there is a benefit either way using blocking or non-blocking sockets in this case. The select/reactor takes care of guaranteeing that there will be data available when the doRead is called so there will be no wait either way. There may be a benefit of removing the while loop from the non-blocking case also. If there was lots of data coming from several sources the loop could cause data to be continually read from one source until the “flood” of data stopped/slowed. With the loop removed then each source gets one read before moving to the next, this allows all sources to perform their reads even if one is being overwhelmed (I am assuming a fair servicing of each source by the reactor). probably a good idea to be safe, though, as it might work differently on other platforms. Twisted’s actual socket code works. Small point, but when reading stuff for the first time I’m very literal! defaults for instance variables is not an uncommon practice. Hey – thanks for the quick reply! Thanks again. Enjoying the series! One of them is a true class variable, and is used by the superclass. The other is meant to be an instance default. Anyway – all good. Then I run the code, It results good. server:10000 sends 30 bytes per time, and server:10001 and server:10002 send 10 bytes per time, they all send more than receiver of getting 4 bytes per time. The only explanation I can think of is: once there is data staying on the buffer to read(no matter the data is fresh or stale), the reactor will call our doRead function until it consumes the entire buffer. ( note: 1. the ‘stale data’ here, I mean, is the data in the buffer which is not yet touched by the receiver because receiving speed is less than the sending speed from server. 2. We have already removed while loop from the doRead function, so the guarantee of consuming data in ‘read buffer’ is relied on reactor). for example(‘*’ means a byte in buffer, ‘|’ means the reactor calls the doRead function to receive data. Yes, I think you’ve got it. Question: Why not use setTimeout on our sockets instead of using callLater? that were actually working, even if one (or more) were not. only willing to block while reading or writing to a socket for so long. timeouts on individual sockets, you need another mechanism. I had misunderstood the setTimeout function when I was reading the docs. Thanks for taking the time to look over my solution. Excuse me if this is mentioned in the later sections but I am working through this tutorial as I speak. For a while I was unable to understand how, the twisted framework knows about the existence of of the Poetry class although it implemented the interface. Then I saw this import which completed the puzzle. Adding a note here so that others who may not see the link get a clue. Thanks for the great tutorials. I’m really learning a lot! It works with one or more of my servers off, but is it better to look for the error somewhere else? Hey James, looks good to me! Did you have a question about this pastebin? now I am learning asynchronous programming! First of all , thank you for such wonderful explanation of not so easy to understand topic. The question is : why do we need now callLater, if connectionLost will react as it’s callback. You are using callLater to timeout the request before the other end hangs up. (Imagine the other side is ‘stuck’ and is never going to close the connection). Yeaaaaap, now i understood the reason. I ‘ve just thought for this particular program, not for something more bigger. callLater solves the problem of stucking nice for ‘reactor’ pattern. Hmmmm, could you recommend some articles OF USING COMET AND GEVENT, PLEASE? I’m not very familiar with gevent. I need some consultation Dave. First of all, one twisted process uses one CPU (one application). If I have 8 CPUs, how can I use them all. It means that 8 processes of twisted must collaborate with each other, but how ? Hi Rustem, you have a few options. First, you can use threads in Twisted, see the deferredToThread API call. Of course, you still have to contend with Python’s global interpreter lock, so that only really makes sense if your threads are calling out to, say, C libs that release the GIL from Python code. But another option is to run multiple processes. One possibility is to have a master process that sends work to slaves. See the open source project Ampoule for an example, and possibility a library to use, for doing that. Many thanks for excellent series of articles. I have just noticed that you wrote “… you pass an object that must implement a given Interface …” at somewhere in your article -in part 4-. As i read from zope.interface documentation, objects does not implement an interface, they provides interface(s). It may not a big deal for those who are familiar with zope.interface concepts, but for newcomers like me it might be confusing. Now you should familiarise two more terms to understand other concepts. First one is ‘provide’ and the other one is ‘implement’. Object provides interfaces and classes implement interfaces. In other words, objects provide interfaces that their classes implement. Ah, ok, I see what you mean. Ok, I will see about updating the text to be more consistent with their terminology. I made some adjustments to the text, how does it look now? that says if a class implements an interface, by the way. It seems to me that the “while” loop inside the PoetrySocket’s doRead method is unnecessary. I removed it, removed the break statements that assumed it, reordered some conditionals, and ran the twisted-client-1/get-poetry.py client with three slowpoetry.py servers. The result was a successful reading of several poems, as far as I can tell. On second thought, perhaps the “while” loop would be a good thing if the socket were receiving message that were larger than its “recv” buffer. Then the loop would repeat until everything the server sent on that socket was read. if you want to read multiple times from the socket, but I don’t claim my solution is the definitive “right answer”. Hi Dave, I need some help with the doread() method. I am clear with all the code within the while loop. But what coonfuses me is the next line. If not bytes condition is true, it means bytes is still a NULL string. Then how does it make sense of having the task finished? poem makes our examples simpler, but it’s not really best practice. In that case say the code got 10 bytes of poetry and the server shut down. How does bytes become empty after the while loop? so you can see what is happening. # connect when the reactor start to let the reactor handle exceptions. Could you please tell me what is wrong with it? Thanks! Hm, did you try calling setblocking after you connect? Hi Dave, thanks for an excellent tutorial. Hello! Glad you liked the tutorial. Using a thread isn’t cheating at all and Twisted itself sometimes does that, see, for example ThreadedResolver. First add ‘self.terminate = False’ to the beggining of the __init__() function, and add reactor.callLater(2, checkFin) at its end. Hi Kareem, I don’t think that would work. What if doRead never gets called after two seconds (because no data showed up to be read)? I think you will need to do something else in checkFin. Otherwise cancelCheckFin is just a local variable in __init__ and the doRead method will not have access to it. Thanks Dave. I’ll keep reading, this is all new to me (networking in general), hopefulley I’ll get the hang of it. I’m eventually going to try using twisted to make a game server for a simple 2-D game for my boys. Just for the fun of it. If I’m undrstanding all this correctly, the client side will have to be plain non-twisted asynchronous programming because I can’t relinquish control to the reactor on the client side, where the game loop will reside. Correct? Hi Kareem! That’s a great project, game programming is a fun way to learn. If the client is in Python, then both client and server can certainly be in Twisted. As you point out, a game client typically has a ‘game loop’. This is simply a loop that waits for things to happen (the user clicks here, or presses this key, or a time tick happens and the state of the world needs to be updated, etc.). Well that’s all the reactor loop is doing, too, it’s just waiting for network events. So the reactor loop can be the game loop. 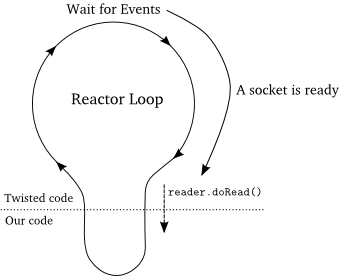 Or the game loop can be the reactor loop. If you program the client with GTK or QT, there are adaptors that allow Twisted to use the GTK or QT event loops as the Twisted loop. There might be one for PyGame, too, I’m not sure. I don’t understand what it means by I/O tasks.Do you mean functions like recv() that take data out from socket,or you mean the process of receiving the data from a server though a connection and putting it into a socket. If the callback is long-running computational task,of course,the ‘select’ loop is blocking when the callback is running.Thus other recv() cannot be called. Hi Tommy, by I/O tasks I mean both reading and writing to a socket. The select statement is used to wait for both reading and writing to sockets because both of those actions may block. So a long-running function will block both readers and writers waiting for their turn in the select loop. Does that make sense? This tutorial is excellent, I am a Python programmer with some experience but never had contact with anything but single-thread, synchronous programming. Nevertheless, with the examples here I feel I am really understanding the ideas. I tweak and check that really I know what is going on. So, thanks for it!! I have a small doubt/comment. When I read the class PoetrySocket I was surprised to find poem as a class attribute. I thought: “all poems are going to get mixed up in a single text variable”. I added a loop with print instructions after they are read, and found that in fact that is not the case, they are correctly stored in the poem attribute of each instance of PoetrySocket. But then, why declare the class attribute poem, empty? Why not set self.poem = ” as the first line of the constructor, instead? Regarding the class attribute — that’s a bit of a shortcut for making default instance attributes. If you don’t set the attribute on the instance it uses the class attribute, but setting an attribute on an instance always sets the instance-level attribute not the class-level one. Setting it in the constructor would work just as well and is probably better as it is less surprising. I understand, in fact I needed to perform a few simple tests to realize that when within a method you evaluate self.att (being att a class attribute) you access the class attribute. But the first assignment self.att = … seems to create the instance attribute att, and any evaluation of self.att after that returns such instance attribute. This behavior of Python bit me, I would not say it follows the Principle of Least Astonishment. When the PoetrySocket is initialised, I add the callLater with a complete_timeout variable that specifies how long a poem must take to complete (5 seconds is crazily low, but I want it to trigger). The method forceClose just calls connectionLost with a explanation about why it is being closed. If the task finishes, the timeout is cancelled (just before main.CONNECTION_DONE is returned). I suppose it would be better to not start the callLater during initialisation. Rather, right before reactor.run()? Everything seems to behave as I expect. Well done, the code looks nice and clean. By the way, great course, I was lost before I found it, thanks!! Glad you like it! It looks like you might be stopping the reactor every time a connection is lost, but the code is making more then one connection. You want to stop the reactor only after the all connections are done. So you’ll need to keep track of how many connections have been made and lost. Make sense? Hey Dave, a lot of sense. The problem was that I included the self.sock.setblocking(0) part inside the try/except. I am writing server in python twisted using tcp for multiplayer game server and all client are mobile app, so issue is that server get stuck or hang after sometime and use 100% cpu what issue may be/ please help. I’m afraid there could be any number of things going wrong. It’s basically impossible to debug a program without the program itself. I have a question. Why the time used by twisted-client-1/get-poetry-broken.py and twisted-client-1/get-poetry-broken.py are same ? I thought they should be different, since the block client should use more time. Good question! The reason is that the broken client does make a connection to all the servers at once and all the servers immediately start writing data. There is some buffering in TCP so by the time the blocking client is ready to read from the second and third severs, all the data is ready to be read. Make sense? So if the poetry is long enough, the broken client will use more time ? That’s right! As long as it’s the second or third poems that are long enough.